One of the important irrigation lakes of a south-central Vietnamese province has run completely dry due to drought, worrisomely forcing local farmers to create small reservoirs with petering-out water supply. Since late March, no drop of water remained in what was known as Ong Kinh Lake, which has the maximum capacity of up to 800,000 cubic meters, in Ninh Thuan Province. It is expected to provide water to thousands of hectares of land growing garlic, vines, and Vietnamese jujube trees. 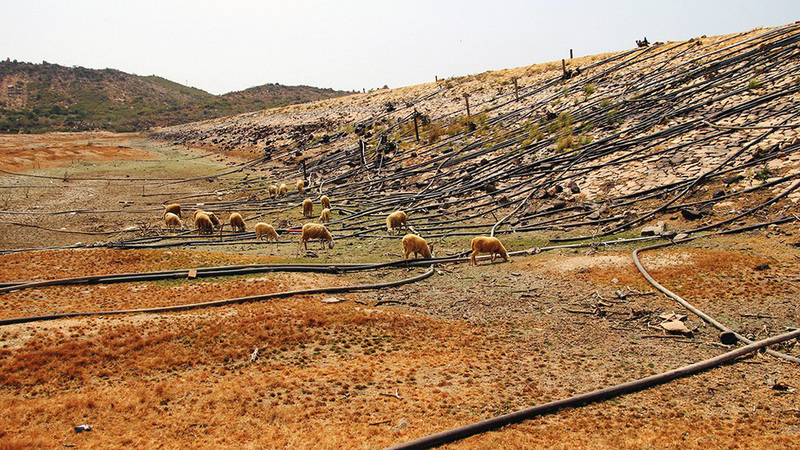 Hundreds of plastic water pipes snaking into the former lake bed lie idle on the parched ground, where sheep graze with their thirst unquenched. Residents who used to rely on the former lake have hallowed out part of the ground around or in the lake bed to find remaining subterranean water. But even this source is also running out within a matter of a few days, and they have to search for water at greater depths. “I’ve got to dig a well about 70 to 80 meters deep, and pump its water into a pond more than one kilometer away,” said Nguyen Huu Moc, a local farmer. The 30-meter-deep well by Pham Ngoc Quang, another grower, has been dry, unable to irrigate his two-hectare plot of land for vines. He had to sink another much deeper well to replenish the present one so that his plants can be watered. A number of farmers have hired excavators to create more extensive hollows as reservoirs. Ninh Thuan authorities have warned that severe drought is likely to occur due to modest rainfall in late last year if no rain comes by the middle of this year. The province is in its dry season, which typically lasts from December of a year to September of the next. It receives the lowest annual precipitation in Vietnam, around 700 to 800 millimeters, chiefly because its lie of land conspires to avoid the benefits from different monsoons.